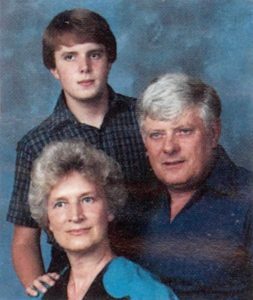 Benjamin Almerine Humphries, Sr. was born on December 13, 1929 to Lassie Royster Humphries (1909 – 1985) and Fannie Pauline Addington Humphries (1911 -2008). Lassie’s family was from the Cleveland County, North Carolina area and Pauline’s family came from Jackson County, Georgia. Ben was certainly the perfect name for this firstborn child of Lassie and Pauline because Ben had been a name used by his grandfathers on both sides of the family. The father of Fannie Addington Humphries was Benjamin Garland Addington (1888 – 1914). The father of Lassie Humphries was Lawson Almerine Humphries (1868-1925) but he carried the nickname “Ben” all his life. 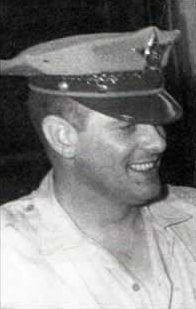 Interestingly, Lawson Almerine “Ben” Humphries was a law enforcement officer and a justice of the peace. As we well know, grandson Ben would follow in his footsteps and later become a law enforcement officer in Rutherford County. Lassie and Pauline lived right across the state line in South Carolina when Ben was born but moved shortly thereafter to the Camp’s Creek area of Cleveland County, North Carolina. Ben recalls his first memory was the day his brother Charles was born in 1932. The doctor came to the house to see to his mother’s delivery and that was the first time Ben ever remembers seeing a car. Ben thinks that he was probably more excited about the car than about the new brother. His brother Max was born in 1934 and then a sister, Pat, in 1938. Ben started school early because of Johnnie Dean Bridges, a little boy in the community that was older than Ben but who was afraid to go to school. Ben, on the other hand, was not afraid of anything. Well, no, that is not exactly true. He was afraid of snakes but that is another story. Johnnie Dean’s folks got tired of taking him to school every day in the wagon, so they started taking him over to Ben’s house each morning so that he could walk to school with Ben. Ben started school at Holly Springs but his family moved around several times and, by the time he was in the third grade, he had attended school in the Trinity, Boiling Springs and Mt. Pleasant Communities. When Ben was in the third grade, he would start school at Cliffside and stay there until he graduated in 1947. As to being afraid of snakes, Ben tells me that, when he was about four, his mama sent him out to pick blackberries and, because of his fear of snakes, he pulled up all the blackberry bushes he could find, roots and all, and drug them back to his front porch and sat there picking off the blackberries. He thought he would be less likely to run into a snake on the porch than in the field. His mother came out on the porch and saw him sitting there picking blackberries and she let him know that she did not think too highly of this idea. 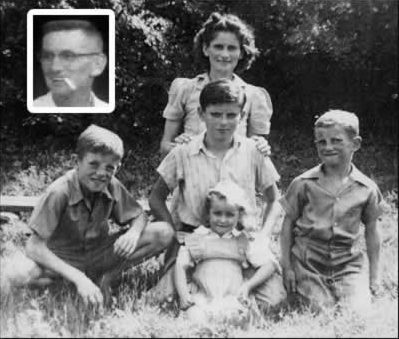 Lassie and Pauline moved their family to Cliffside in 1937. Ben entered Mrs. Beatty’s room in the third grade. He was seven years old at the time. Ben claims that he was not much of a student in school but he loved history. In fact, he loved history so much that he had read the whole section of books in the library pertaining to history even before Mrs. Gladys Tinkler assigned them to his class. He recalls that, when she took his fifth grade class to the library she told each student to check out a library book from the history section. Ben wouldn’t check out a book. He told her that he had already read every book on the history shelf. Mrs. Tinkler did not believe him. She sent him down to Mr. Beatty, the principal, for the third degree. Mr. Beatty proceeded to ask Ben history questions to see if he had read all those books as he claimed. Ben is proud to say that he did not miss a single history question posed to him by Mr. Beatty. Except for his love for history, which has stayed with him all his life, Ben admits that he was not a scholar. He claims that his talents in high school ran more along the lines of sports and charming young ladies. He credits Daphene Ledford and a few other classmates for helping him with his home work. In his high school yearbook, he is shown as both “Most Attractive” and as “Best Looking.” He also shows up on all the sports teams. He was a pitcher and a first rate hitter on the baseball team and a great basketball player. During the County Basketball Tournament, Cliffside was playing Ellenboro and Wayne Haynes set Ben up with a girl from Ellenboro so they could double date after the game. 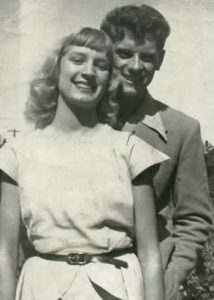 Ben’s date turned out to be a gorgeous blond cheerleader named Marilyn June White. Ben spotted her in the gymnasium at Cliffside during the game. Ben recalls that the first time he ever saw June he remembers thinking that she was the prettiest girl he had ever seen in his life. She would later become his wife. Incidentally, Miss June White was the sister of none other than our very own Phillip White. Ben recalls that his first date with June was particularly memorable because, for the double date, Wayne had borrowed Barney Tessener’s truck and the young couples rode in the back of the truck up to a friend’s house to borrow a car. Unfortunately, Mr. Tessener had previously been hauling hogs in the truck. On future dates, they may not have had to worry about riding in a smelly farm truck but they did have to worry about June’s pesky younger brother Phillip always being under foot. Ben says that June would give Phillip a nickel to sing and Ben would give him a nickel to quit singing and leave them alone so Phillip would end up making money both ways. Ben and June courted a while but, as Ben recalls, they could not wait to get married. They married in 1948 and had a daughter in 1949. They named their daughter Lala June. Those of you who know Ben well know that he is a Democrat. June’s mother and dad were strong Republicans. However, after June married Ben, she registered Democrat. June’s mother told Ben that she did not mind so much that he took her young daughter away from her but that it really hurt that he turned her into a Democrat. Ben worked in the Cliffside mill as a weaver, loom fixer, supervisor in the cloth room, supervisor in the weaving department and at various other jobs. 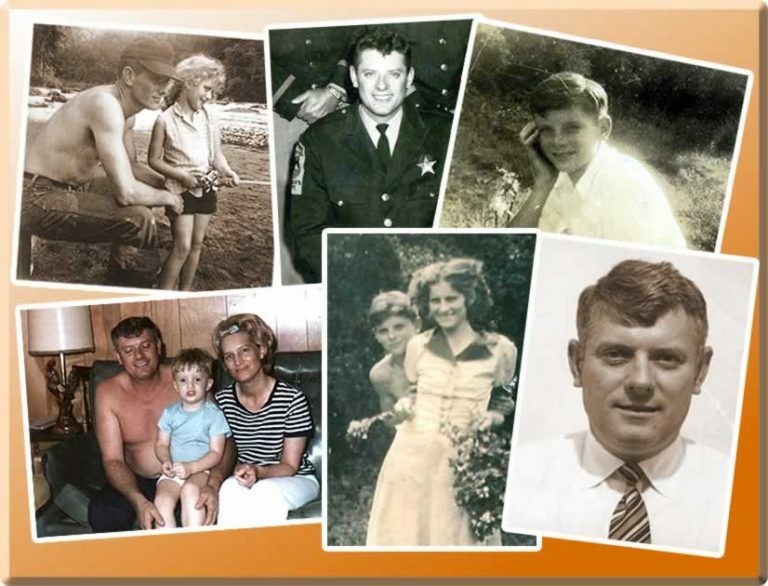 In 1958, he left the mill to become a deputy for the Sheriff’s Department in Rutherford County. Ben has many, many stories of his days at the Sheriff’s Department, some I can tell and some I cannot. It is safe to say that Ben would have played some role in the investigation of any major incident that you can recall happening in this area in the late 1950s, 1960s and 1970s. He investigated hundreds of crimes, looked for lots of moonshine stills, caught a few bank robbers and testified in lots of court cases. In 1969, Ben and June realized that Lala was grown and on her own and they had an empty nest to fill. 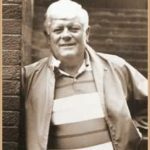 Soon after they decided they needed another child, June delivered a son who they named Benjamin Almerine Humphries, Jr. Everyone always called this second child Benjy and he was truly a remarkable person all his life. Benjy was warm, loving, intelligent, talented, and musical. After college, Benjy fell in love and married Denise Louise Thrift, a beautiful Cliffside girl, and they had two precious daughters, Eva Alane, born in 2003 and Avery June, born in 2005. Ben’s love for the old time country music that he likes to call “Broad River Music” led him to organize an annual event to honor local musicians. He called it the Snuffy Jenkins Old-time and Bluegrass Music Festival. Ben put this festival together as a tribute to the contributions of Dewitt “Snuffy” Jenkins and his brothers who were from the Harris community. 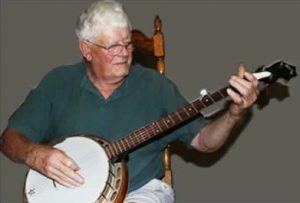 In addition to Snuffy Jenkins, the festival featured the music of Homer “Pappy” Sherrill, Greasy Medlin, Doc Watson and Raymond Fairchild to name just a few. Our own local Dan Padgett played at the Festival. People came from all over the country and all over the world to attend this festival. Ben tells the story of the year that a couple came from Japan to attend. 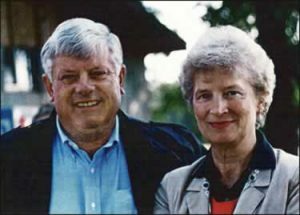 For fifteen years, Ben and June held this event at a park Ben built near Cliffside that he named the Snuffy Jenkins Bluegrass Park. Ben has always loved sports, particularly baseball, and he coached American Legion Baseball in Rutherford County for a number of years. After working in the Sheriff’s office for many years, Ben stepped down from that job and became a bail bondsman. He had an office near the courthouse in Rutherfordton and he did that until he retired. Soon after Ben and June married, June worked part-time as a telephone operator in Cliffside and later in the mill. She attended Gardner Webb College at night taking business courses and even before finishing had lined up a job with Wade Matheny’s Ford Dealership in Forest City. June worked for Wade Matheny as a legal secretary and later as a licensed insurance agent, retiring after 30 years. Tragically, in 1985 doctors diagnosed June with multiple myeloma, cancer of the plasma cells in bone marrow. Ben says that June delayed going to the doctor even after she knew she was seriously ill. Even prior to her diagnosis, she had sustained multiple fractures, suggesting that something was wrong. Even knowing her prognosis, June insisted on continuing the annual music festival even during the years she was gravely ill. Ben relates that June also insisted on doing their income taxes as she had always done every year, up to and including the spring she died. Ben always thought that June’s desire to carry through with these routine, annual events helped her keep fighting. On May 31, 1990, she died at age 57. Ben lost his longtime companion and his best friend. He has never remarried. Ben stopped hosting the music festival the year that June died. He says that he knew he could not do it without her help. Ben lost his dad, Lassie Humphries in 1985. Ben’s mother Pauline outlived Lassie by 23 years; she passed away at age 96 in June 2008. In 2005, Ben lost his brother Max to a heart attack. In March 2011, Ben’s sister Pat died following a stroke. In November 2009, Ben lost his son Benjy. Benjy was only 40 years old when he died. He was a graduate of Chase High School and Gardner Webb University. While at Gardner Webb Benjy studied music and math education. He had done graduate work in Counseling and he completed his Master’s in Media Education from Appalachian State University just a month before he died. Benjy was testing coordinator for Gaston-Lincoln Community College when he died. He was also the pianist for Cliffside Baptist Church. Benjy died of a heart condition, leaving his wife Denise and two daughters, Eva and Avery. Ben and June’s daughter Lala graduated from Chase High School in 1967. Like her father, Lala excelled in sports. In her high school year book she was named “Most Athletic.” Lala was co-captain of her high school basketball team and her team won the state championship in their division her senior year. She later graduated from Gardner Webb College and married Jerry Seagle. Lala and Jerry were both teachers in McDowell County. Ben tells me that Lala was an excellent teacher, at one time a nominee for Teacher of the Year. Lala recently retired after teaching for 30 years. Lala and Jerry have two beautiful and talented daughters, the older one, Lara Pauline and the younger one, Carrie Leigh. Both daughters became teachers. Lara married Jarrett Whiteside and Carrie married Josh Hayes. Lara and Jarrett have two sons, Colby and Blake. Carrie and Josh also have two sons, Ryan and Scott. Ben lives alone in the house on Island Ford Road that he and June built for their family in 1965. He has covered the front of his refrigerator with photos of his four granddaughters and his four great grandsons who lovingly refer to him as Paw-Paw Ben. He spends his time in the winter months cutting firewood and in the summer months working in his garden and canning vegetables. Ben still keeps in touch with some of his old bluegrass music cronies and he still plays his banjo when he takes a notion. Ben has focused his love of history onto tracing his family roots and the folklore surrounding Cliffside. People from all over the country call, write and visit Ben to get help tracing their family trees and Ben is never too busy to oblige. He has volumes of reference books, church histories, old photographs, census data, county recordings and other historical documents he has collected over the years. Most importantly, he knows a million stories and he loves to tell them. Now, as I said before, Ben is a Democrat, died in the wool, no doubt about that. To his credit, I have often heard him say, “If I like a man, I don’t care if he is a Republican.” And Ben does like people. And people like Ben. This story originally appeared in the Fall 2011 issue of The Cliffside Chimes. That’s how Ben usually disseminates his stories, but Janna Harris has captured some to print. Now we can enjoy these few over and over. For others, you’ll have to track Ben down. I really do not know how my dad and mom got together. I know they lived just across the river from each other but I don’t recall ever hearing how they became acquainted. I do know, however, how my mama, Pauline Addington, originally from Jackson County, Georgia, wound up in Cleveland County, North Carolina. This is a good story. If not for the events that unfolded in the story below, I don’t guess I would be here. My mother’s daddy, Benjamin Garland Addington, died in 1914 leaving Lottie Addington a widow with small children. Lottie remarried Joe Hayes. They were living in Georgia during a time when the boll weevil was ruining the cotton crops and some of their neighbors had moved up to Cleveland County, North Carolina, hoping for a better living. Joe Hayes, my mother’s stepdad, went up to Cleveland County to visit some of the neighbors who had relocated. He wrote a letter back to his wife stating, “Lottie, pack up and bring the kids up here. This place is wonderful. Money grows on trees, the women wear silk stockings and the brooms have handles!” Lottie did as she was told, gathered up the children and took the train to Lattimore. That is how my mama ended up in North Carolina. The Humphries family. Father Lassie shown in the inset. Pauline kneels behind the children. Pat, the youngest, sits in front of Ben. That’s Charles at left and Max on the right. When my brother Charles and I were just small boys, not even in school yet and my brother Max was just a baby, mama left us at the house while she went out to the field. Charles and I loved tea cakes, these little cookies that mama always made us. Now, I had watched mama make them a hundred times and I didn’t see why I couldn’t make some. She had left the bread tray sitting out there so I got some flour and some sugar and poured it in the bread tray. I knew I had to pour something in there so it would stir up and I couldn’t get to the milk so I got the coffee pot off the stove and poured cold coffee, grounds and all, in that bread tray with the flour and sugar. I was stirring it up the best I could. I guess I didn’t think it through any farther than that. Mama came in from the field and saw that big mess I had made in the bread tray with that flour, sugar, cold coffee and coffee grounds and, let’s just say, she was not happy about it. When I was a kid I was crazy about candy and occasionally our mailman on Gaffney, Route 2, would leave penny candy in mailboxes for the children on the route. Well, that just set me off. After that, I was at the mailbox every day to see if there was going to be any more candy. If there was going to be, I was going to be sure that I was the first one there to find it. One day there was a little package in the mailbox and I shook it and it rattled like candy. I tore into it and took a piece out of the box and put it in my mouth and it was the bitterest candy I had ever tasted. I ran to the house crying and pitching a fit and mama had to rinse my mouth out with water. We found out later that the Health Department had sent all the farmers pills to put in the water for their chickens to prevent cholera, and that what I had thought was a box of candy had actually been a box of pills to put in the water for the chickens. Well, at least, I never got cholera and neither did our chickens. In the early 1930’s a letter went out to parents in the Camps Creek community directing them to take their children to Bridges Store, there at the cross roads, to get typhoid fever vaccinations. When word got around among us kids of what was coming, there was a good deal of panic. None of us kids even knew what a vaccination was but we were pitching a fit anyway and none of us wanted to go. I remember fussing about it just like all of the other kids in the community. However, mama told me that, if I would promise that I would take the shot and not complain about it that she would give me two eggs that I could swap at the store for a bag of candy. Well, as I told you before, I would do anything for candy so I promised her that I would take the shot and I shut up about it. She gave me two eggs and I put them in a matchbox. On the day we went for the vaccinations, I took my matchbox with the two eggs along with me to Bridges Store. They were giving the shots there outside the store and all of the kids were pitching fits. Well, I guess I decided that this was going to be worse than I had imagined and I started protesting like the rest of the kids. I don’t know exactly what happened but after I had the vaccination, I opened that matchbox I had been clutching the whole time I was waiting my turn to be vaccinated and both my eggs were crushed. I didn’t get my candy after all. When I was just a young boy, maybe 12 or 13 years old, Mrs. Grover Haynes, the Postmistress, hire me to sweep out the post office. She would pay me ten cents a day, good money for a kid those days. The post office was going to be closed on Christmas Day but Mrs. Haynes wanted me to come in anyway. The problem was I had gotten a fielder’s glove for Christmas that year. We had also gotten some oranges. My brother Charles and I were throwing oranges back and forth trying out the fielder’s glove and I absolutely forgot to go sweep the post office on Christmas morning. When I came in the next morning I no longer had a job. Ina Haynes outright fired me. I think that is the only job I ever lost. I learned a great lesson from that. When you are working for somebody else, you do what they ask you to do if you want to keep the job. If you don’t, you suffer the consequences. Mrs. Haynes remained a good friend of mine as long as she lived. She was a dear lady and I had a great deal of admiration for her. As you know, Rob Sparks had a barber shop in Cliffside for many years and it was a place where the men folk not only got their hair cut but where they came in to talk sports and politics, and to occasionally tell jokes or to even play practical jokes on each other. Well, Rob would let some of us high school boys work for him. He didn’t hire us directly but, instead, the way it worked was, we sort of sold the job along the line from one boy to the next. I remember I bought the job from Bobo Bostic for $5.00. Well, the job mainly consisted of shining shoes, but every Tuesday I had to clean up the barber shop. And this story I am going to tell happened on a Tuesday. During World War II the cotton mill in Cliffside wasn’t running in the summer and I recall sitting around listening to people talking. I remember one conversation in particular between two old guys, Hammie Harmon and Little Charlie Ruppe. We always called Hammie Harmon the “traveling man” because he always claimed to have been everywhere. Anyplace anybody mentioned, old Hammy would claim that he had been there sometime in the past. Heck, he would usually claim that he had just got back from there last week. Well, at that time Cliffside’s main street was the way to points north and south, and bus lines routed their buses right through town. Well on this particular day, a bunch of mill people were sitting around town shooting the bull and a bus came through that had “Augusta, Georgia” across the front as the destination. In 1965 two fifteen-year-olds, Edgar and a neighborhood boy got into it out in the yard at a house near Henrietta. Apparently they were fighting with their hands, something they referred to as “sparring.” When Edgar got the better of the other young man, the second young man went into the house and got a rifle, came back and allegedly shot Edgar in the chin, severing his spinal cord and rendering him a paraplegic. Now I was at the scene shortly after it happened and I went with Edgar to the hospital. He told me how it all happened but later recanted his statement and the incident was treated as an accidental shooting. At any rate, because I had been involved in the investigation, I got to know Edgar and his family. It was a sad situation. The family did not have any money and it happened in the hottest part of the summer. Virginia Biggerstaff who worked for the Courier at the time called me to get my help in raising money to buy an air conditioner for Edgar. I decided that, rather than stop with only an air conditioner, we needed to make an all out effort and raise enough money to buy him a television and to provide him with some spending money for incidentals. Thanks to the generosity of all of the good people in this county, many of them from right here in Cliffside, we were able to do just that. Edgar only lived a little over a year after being shot but we like to think that our donations brought him some comfort. A bunch of us rowdy guys used to love to travel all over to go to baseball games and we would designate a driver so that the rest of us could drink a little beer along the way. Well, on one trip to Florida for a game, I was sitting in the back seat with a video camera and my good friend Windy Powell was sitting in the front seat sleeping and snoring up a storm. I filmed him sitting there snoring and, when we got back in town, I made sure there was a crowd gathered there at Windy’s Café and I showed that video and told everybody that he had been drunk. Well, Old Windy swore he was going to pay me back for that. Sometime later, we went to Pittsburg for the World Series and that trip I was the designated driver. I had to drive the whole way up there and when we got to the motel, I tried to sleep a few hours. As it turned out, those boys would not let me sleep and they dragged me over to the ballpark way before it was time for the game. I was dead tired so I just sit down in the bleachers there in the warm sunshine and tried to take me a nap. Windy had his video camera with him and he decided it would be a good time to video me to pay me back for filming him on the Florida trip and he must have shot some video of me sitting and snoring. We got back home and he set his video equipment up in the café and made sure that everybody gathered round because he was going to pay me back and show that film of me. Well, I declare, he ran that film and showed a bunch of stuff of us driving up there and players warming up and this and that, but when he got to that part the film where he was going to show me sleeping and snoring the film was completely blank. He never did figure out what happened. I am going to tell this story without giving the names of the people involved. I hope you will still get the point of the story. I think it a good illustration of how living in Cliffside all my life and knowing the mill people as I did helped me do my job as a deputy sheriff. There was a man that worked in the mill that I thought the world of, and who I would like to think thought a lot of me. We had worked in the mill together before I left the mill to work in the sheriff’s office, and he was just a good, honest man. He was one of the finest men I ever knew and after working for 40 years in the mill, he had moved to Cleveland County. After I had gone to work at the Sheriff’s Department this man’s grandson got into some trouble with the law and I needed to find the boy. Several people told me that the grandson was staying with his grandfather, the man I knew and admired so much, over in Cleveland County but that it would be a waste of my time to attempt to get the family to cooperate in turning him over to the sheriff’s office in Rutherford County. I disagreed because I knew the grandfather, having worked with him in the cotton mill for years, and I trusted him to do the right thing. I called Buddy McKinney, another good friend of mine, who was the sheriff in Cleveland County, and asked him to meet me at the man’s house where the grandson was reportedly staying. The sheriff did not even have to get out of the car. I went to the door and asked my friend if his grandson was there because I knew good and well that he would not tell me a lie. He told me, yes, his grandson was there. The boy had seen the patrol car pull up to the house and had turned the light off in the living room and was sitting there in the dark but my friend opened the door for me and I walked right into the house, turned the light on and arrested the grandson without incident. When I was working for the Sheriff’s Department in Rutherfordton I was also coaching American Legion baseball for one of the county teams. I was off duty from the Sheriff’s office and dressed in my baseball uniform but I was driving the patrol car. I was taking a bunch of players to Cherryville for a game that night. When we got to Cherryville the street was closed and we had to take a detour down a side street. As I drove down that street, I saw a man sitting on the porch of one of the houses and I recognized him as someone who had escaped from the Rutherford County Jail. I just stopped the car there in the street. He recognized me as well and he took off and ran into the house. I got out of the car, jumped the fence and ran into the house after him. I chased him through the house and out the back door. I caught up with him out behind the house in the garden. After getting the cuffs on him, I took him to the police station there in Cherryville. I think the officers there at the station were a little skeptical when they saw me walking in there in my baseball uniform leading a prisoner. But once they called back to Rutherford County and verified that this guy had, in fact, escaped from the Rutherford County Jail, of course, they took him into custody until Rutherford County could sent somebody down there to pick him up. I went on to coach the ball game and, as I recall, we won the game.